Loose lay entrance mats have you considered using them. With winter coming and all the wet and dirt being tracked into the entrance area of your building, don’t you think wet floors just look bad. 40% of cleaning budget of commercial buildings are spent on cleaning the floors and circa 100 grams per day per 1000 people can be tracked into a commercial building. Tracked in wet and dirt will be significantly reduced by using loose lay mats. Who wants to see the image below when you first walk into a building? Your entrance area is the first and last representation of your business a customer will see when they enter and leave your building, creating the right impression is important, the use of loose lay entrance mats will improve that impression. 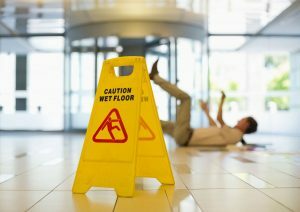 Wet floors don’t just look bad either there a real danger of slips and trips. Slips & trips are the most common cause of major injuries at work and they occur in almost all workplaces, 95% of major slips result in broken bones. A mat rental service to businesses consists of a fortnightly or monthly lift and lay of your dirty mats for clean ones, depending on your requirements. Mats are laundered at state of the art laundry where they are warm washed to ensure the mats are bacterially clean and the pile of the mat restored to optimum efficiency. Alternatively if mat rental is not something you would consider simply buy mats, it is worth considering either purchasing mats or using a mat rental service, Ginger Mats can offer both options to suit your requirements and budget, the solution does not have to break the bank, prevention is better than cure..
To sum up using loose lay entrance mats is a saving on cleaning bills, prevents wear and tear on surfaces, improves front of house presentation, helps prevents slips and trips in wet weather, logo Mats add corporate identity and brand placement and a mat is 24 Hour Janitor.